Plant-based HealthTrim® Matcha Vegan Shake is my favorite go-to drink at breakfast. It’s a clean and lean protein and I love it’s nutty, earthy taste and creamy texture. Plus, with its omega fatty acids, essential amino acids and antioxidants, I know I’m doing my body good with every sip. Matcha Vegan Shake also makes a great meal replacement or nourishing snack during the day. It helps support my weight management goals while improving my mood and reducing stress. My appetite is minimized throughout the day, yet I still have the energy to accomplish what I need to get done. Here are other ways to benefit from this nutritionally packed powder that are definitely worth trying. Combine half a packet of the vanilla flavor with one tablespoon of sea salt to make a sweet popcorn seasoning — a healthier alternative to butter. Sprinkle a few teaspoons on top of low-fat yoghurt. Add two teaspoons and a handful of nuts to your morning oatmeal. Add a packet to white icing to enhance the flavor and the color. Make this Matcha Vanilla Shake Cake. Add a packet to homemade ice cream. Add a packet to pudding for a vanilla or chocolate flavor. You can also add some micro-sliced Mila® chia for texture and healthy omega fatty acids. Blend chocolate or vanilla flavor with plain cream cheese to spread on your bagel. Mix vanilla or chocolate flavor with low-fat plain yoghurt to make frozen popsicle sticks. Add kiwi slices or grapes. Not only do these taste great, but they shimmer in a beautiful green. Add a packet of either flavor to pancake mix, or use it to dust the pancakes instead of powdered sugar. Make gelatin molds. Combine three cups of hot Matcha Vegan Shake, ¼ cup raw honey, and three tablespoons gelatin powder in a bowl. Pour into mold and freeze. Blend either flavor into smoothies for a slightly earthy, slightly sweet taste. With 19 to 20 grams of protein per serving, this is a great product to add to homemade protein bars. Freeze a batch of matcha ice cube trays to add to water. Use it as a flavoring in cakes, cupcakes, cookies and brownies. It’s your turn to explore the versatility of this superfood. How will you use Matcha Vegan Shake? Share your creative ideas with us at marketing@livepure.com. 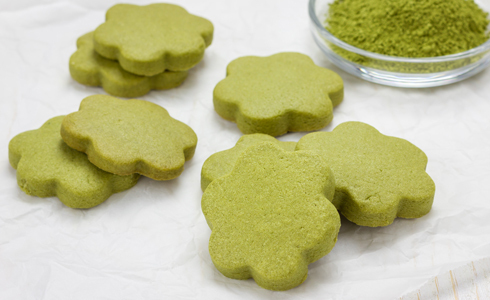 Discover delicious recipes using Matcha Vegan Shake on our blog at gplivepure.com. Purchase Matcha Vegan Shake in vanilla or dark chocolate today at livepure.com or call our Sales Support line at 866-535-5888. Available in on-the-go packs or 14-serving-sized bags. Jennifer Evans is the marketing copywriter at PURE. Her colleagues refer to her as “eagle eye” as she rarely misses a beat. She heads up writing all content for PURE, blending in her health “know-how” and her love of exercise and good food. She never misses a day without a cup of vanilla Matcha Vegan Shake. Motto: Love yourself enough to live a healthy life style.